I last heard Fiona Hile read poetry here alongside six other shortlisted nominees for the 2017 Helen Anne Bell Poetry Bequest Award. It's a bequest that offers a modest cash prize and publication for the winning manuscript by an Australian woman poet. Fiona received the award and so that also funded the publication of her poems with the dedicated, diverse and dynamic publisher Vagabond Press. 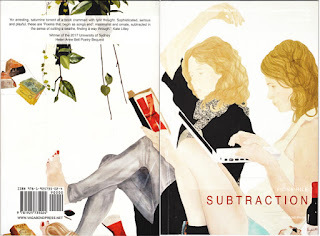 So now we have this book called Subtraction. Of course, in arithmetic, 'subtraction' is the operation of removing objects from a number of them or, simply, taking something away. Given the title, the book's fascinating cover is apt - it's a detail from Helen Johnson's painting called 'Things People Say They Should Give Up'. A woman leans back with one arm extended upwards in a feline stretch as she's engrossed in reading Karl Marx's Das Kapital. The other woman is using a laptop - we can speculate on what she's doing - there's a bunch of 50 and 100 dollar notes and what I take to be hunks of tuna under a trailing vine and, in the corner, just slipping off the cover, there's a very canny product placement - a bottle of Penfold's Gr... 'Gr' - it has to be 'Grange'. One question is - Who would have a bottle of Grange in the first place? Probably not a poet. The only person I can think of who 'gave one up', so to speak, was Barry O'Farrell (that's a New South Wales joke). Perhaps the poet, the painter, or the publisher might send an invoice to Penfolds for the product display? What would Karl Marx say? 'Hologrammatic labyrinth' is a great term for Fiona's poetry. The intensity of these poems' persistent and kind of heady rush of imagery might cause a minimalist poet (like me) to lose sleep. The rush can sometimes seem like you're streaming glossolalia but happily Fiona's poems, although forceful, aren't actually charismatic, so they're not trying to persuade or sway anyone - they're investigative - of both poetry and their topic, 'love'. There is a sense of method in the clusters of images and scenes, or vignettes. The idea and the main question is foregrounded, so once you tune in to the theme you can surrender to the totally impressive offbeat and unpredictable connections and abutments. Fiona gestures to philosophy in these poems. Though we know that philosophers and poets haven't really got along very well since at least the 4th century b.c. when Plato banished poets from the republic. Nonetheless, Fiona does read philosophy. Plato's academy had an inscription engraved above the door - 'Let no one ignorant of geometry enter'. The still-living French philosopher Alain Badiou might have had an influence on Fiona's writing. In his book on twentieth century writing, The Age of The Poets, he revisits the Platonic antagonism between poetry and maths. Fiona's book's title alludes to a connection with mathematics. She also selected the poems for a recent issue of 'Cordite Poetry Review', her chosen theme was 'Mathematics' - though Fiona has said that she's not really into maths. In Subtraction an occasional guest is the precursor to existentialism, early 19th century philosopher Georg Hegel. Along with his theories of the spirit or the 'geist', Hegel had things to say about the connection or function of desire in the everyday world. And these poems consider exactly that. In Fiona's poem 'Recollections of the Mortal Body' - set in the local swimming pool - some lines go - 'your silicone shadow glimmering against the hurricane,/ like love as the fiction of a sublime pragmatics,/ the aluminium waters sinew and repeat: shame enters/ only through the recollection of the body.' That last line, direct from Hegel. 'Stochastic' - a term used in statistical analysis. It's about having a probability distribution, usually with finite variance - so it's imprecise. In a recent conversation Fiona mentioned a part of the Greek myth in Homer's classical epic poem 'The Odyssey' that's perhaps an analogy or at least a suggestion of what function writing these poems might have proffered. While Odysseus's consort Penelope waits for a decade for him to return home from Troy to the island of Ithaca, she uses weaving as a device to turn away over 100 advances. Penelope tells these many suitors that she will marry one of them when she finishes weaving a burial shroud for Laertes, Odysseus's father. It's a fib. She weaves the shroud during the day, at night, away from the attention of the suitors, Penelope undoes the weaving that she'd done that day - it's an artful yet labour-intensive defence - the weaving and unweaving perhaps similar to the process of making poems. In Subtraction the conundrum of encounters with the possibilities or absence of love is unravelled, but here the threads or lines haven't all been discarded. These poems are doing a lot of thinking around both the renunciation and the pursuit of love and/or desire. That's a big topic. Some say poetry resists the concept of use value - its function is to make culture - poetry is thinking about thinking. It's something that I'd say Fiona Hile does round the clock. These are wonderfully difficult poems - I can't say that I've figured out everything about them and I've presented only a smidgen of their references and concepts - I didn't even mention Heloise and Abelard, John Keats, Edmund Spenser's Calidore, the knight of courtesy, (adlib : not even maybe o I dunno - Michel Foucault?!). Which is exactly why I'd suggest that this book will be read, reread, and read again. There's plenty to impute, to love, to think about, to laugh with, to be both perplexed and charmed by and, overall, to take pleasure in appreciating the superlative artistry of a poet whose presence in Australian poetry signals a unique rejuvenation of the genre. It's a complex, fabulous set of poems - congratulations Fiona! *Hellespont - the ancient name for the Dardanelles, named after the legendary Helle, who fell into the strait and was drowned while escaping with her brother Phrixus from their stepmother, Ino, on a golden-fleeced ram. FH in an email to me: And maybe the whole book could be said to perform writing as a way of calling love into being and also keeping it at bay. Or writing installed as a more bearable fake obstacle to the absence of love. p.s - 'Stochastic'- incidentally there's a tea room in King Street Newtown called 'Stochastic' - I'm not sure what the service would be like. p.p.s. - Everyone knows Lou Reed & John Cale's song for Andy Warhol - 'Trouble with Classicists' - yes?